Per Janel's request I will be posting projects that I'm working on, mainly the completed ones. I think she misses seeing what I'm working on. I guess you need to move back, Janel. This is a scarf I started for my plane trip. 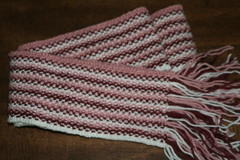 I saw this project done on Knitty Gritty and liked the way it looked. (This is were I got the stitch pattern for my backpack. Love it!) 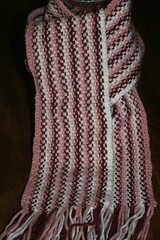 Plus it's the easy way to do horizontal stripping, knitting lengthwise. I thought it would be the perfect thing to work on while on the plane. I was very worried about my knitting needles making it through security. The TSA website says they are approved but I had read too many comments on the internet about people having their knitting taken from them. That's not nice. I got bamboo needles, they look less weapon like than the metal ones. I called the airline to make sure they didn't have a problem and I got through just fine. Even my blunt nosed scissors made it through. Back to the project, the yarn is Bernat Berella "4" - the afghan yarn. I choose to make it in Winter White, Pale Antique Rose, and Medium Antique Rose. It's 100 inches long and about 4 1/2 inches wide. The 100 inches means I had 450 stitches to work in every row! I would like to make a hat to match and maybe if I'm adventurous enough I'll try for gloves. My next project is for Mickey, a late birthday present. I had planned to finish this project while I was away but I took the wrong "material" to work with. The correct "material" is coming today and then I can get to work on it. I will hopefully have it done in about a week. If anyone has a request for Christmas get it in soon. Michelle have you fixed the drawing for the gift exchange? If so let me know what you want. I can't wait to see what this "project" is! Maybe those long old school gym socks? Oh boy! Keep wishing. And stop guessing I won't tell.